Someone is shackled and everyone would come along and get their pictures taken with him? Yes, that was normal. What would they do with the photos?Hang them up at home. Were there all kinds of improper conduct?There's no such thing as a "proper" checkpoint. That's how you feel.You can't run a checkpoint properly. How is this manifested?A young soldier in the company (there are these mixed companies of older and younger soldiers) and he does 8-hour shifts at the checkpoint, 8 hours break for sleep, 8 hours at the checkpoint, he's no longer objective. It's his little life and all his moods and his nerves all come out there, and it's reflected in his treatment of Arabs. For instance?Yelling, aggressiveness that is totally unnecessary. There was also this fun thing with car keys. Every time there was curfew or some such procedures, games of the army, detaining someone driving along, a jeep comes along, picks up his car keys -let him find them himself. He was told to reach the brigade HQ. "Next Sunday you'll get your car keys back." On many occasions the keys would simply get lost, be thrown into the jeep and one guy would pass them on to another and they disappeared. Was there an official procedure handed down from command? A procedure or just a whim?Just a whim. Whose? The soldier's on the spur of the moment, the company commander's?With us it was the platoon commander's decision. That same platoon commander?Yes, I recall we were in Hebron and we had a whole collection of car keys in our jeep. And IDs. Guys would take IDs from Palestinians and not give them back. Were there instances at the checkpoints of bribery, like cigarettes, food, money, humiliation, tasks?That happened all the time. 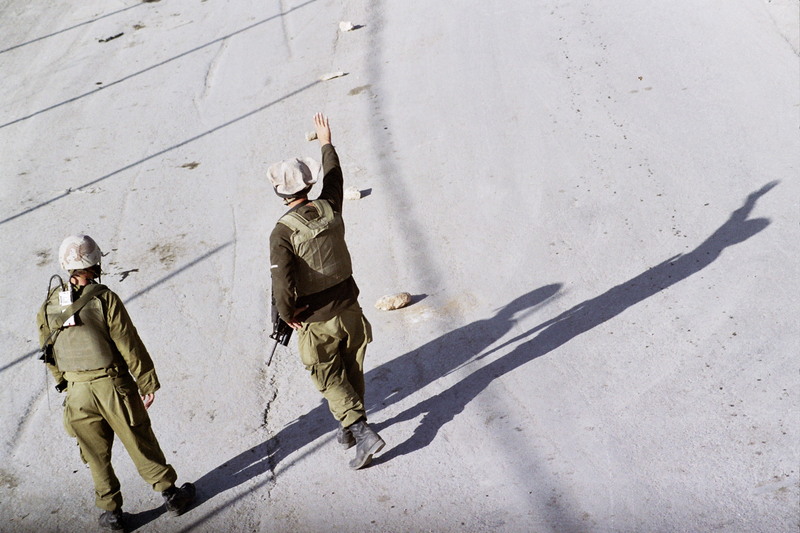 People would receive things, from cigarettes and food… There was a checkpoint in Hebron. I forgot which. Some little checkpoint in Hebron, don't remember where. In town or outside?Outside. There were lots of commercial vehicles. The soldiers in the platoon would compete to see who manages to squeeze the most out of people. Starting with Coke trucks… They would make them stand there until… harass them until the Arab would realize he had to take down something. At the post above the checkpoint there were 5 soldiers. There was a platoon that would man the post and checkpoint and they were the only ones who did the checkpoint. At that post there were whole cases of Coke and Arab snacks, and this got out to the platoon commander, like, he knew it was happening, but okay… No, why shouldn't the soldiers get snacks, any car that was carrying stuff, 85-90% certainty the driver would give the soldiers something. Drinks, food, stuff like that. Were there soldiers who complained, objected?Yes, I did all the time. The platoon commander and I were in constant friction. I was the most frequently punished soldier in my platoon. Constant friction. Until finally I had him thrown out. How long were you with him until you realized this couldn't work, until the day you…A long time. Nearly a year. Explain how you survive a year in a situation which for you personally is impossible?Truth is we were hoping he wouldn't come back after a year, and at the last minute he asked to stay and we got stuck with him. You regard things on the personal level, to cope and manage?You care less, somehow. Only after you get out of the army do you look back and realize what you did. Were there others? What was the dynamic like in the platoon, in the company, social pressure, where did that go, what was the talk like?Most were into it. Most guys were very extreme. There were two others with me who felt bad. Didn't touch things, did nothing of the sort their whole time in the army, but it didn't bother them enough to get up and actively do something about it. Eventually they did. Two went to the company commander with me, that was the most. When I approached the battalion commander, I was already on my own. They didn't come along. How were you treated? Did you come to soldiers and say, don't do this?I didn't say. I didn't do. Criticism was voiced only in private?Yes.